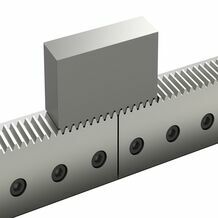 Composite gear racks are mounted with the help of a rack mounting tool. Cookies are small text files that are stored on your computer when you visit our website. You can remove the cookies if you want but these may prevent you from using parts of our website. For the removal please check your browser menu. If you want to learn more about the cookies we use please click on “more about our cookies” at the bottom of this dialog. With the slider below you can enable or disable different types of cookies. For your new settings to take effect, this page will automatically refresh when you click “save and close”. Type Permanent This cookie will be stored for 12 month max. or until you change your cookie settings. Type Session Session cookies exist only during your visit of our website. The visits ends when the browser window or the browser is closed. Purpose Anonymization of user data. This cookie is set by the statistics server (statse.webtrendslive.com) which is operated by Webtrends in the United States of America. Type Session in case of stage 1 (necessary) or stage 2 (comfort). Session cookies exist only during your visit of our website. The visits ends when the browser window or the browser is closed. Permanent in case of stage 3 (statistics) or stage 4 (targeting). The cookie is stored on your computer for a maximum of 12 months or until you change your cookie settings. Purpose This cookie contains information regarding your use of the website, e.g. referrer, first page visited. The information is sent anonymized to the statistics server (statse.webtrendslive.com) which is operated by Webtrends in the United States of America. Purpose The cookie contains information on your usage of this website, e.g. referrers, time, and page the visit was started. The information is sent anonymized to the statistics server (statse.webtrendslive.com) which is operated by Webtrends in the United States of America. Type Permanent The cookie will be saved for a maximum of 12 months or until you change your cookie agreement settings. Purpose The cookie contains information on your usage of this website. In the statistics setting, they will be saved to the cookie and updated during repeat visits. The information is sent anonymized to the statistics server (statse.webtrendslive.com) which is operated by Webtrends in the United States of America. Type Session This cookie exists only during your visit of this website and will be automatically deleted when you close your browser or the browser window that contains this website. Purpose This cookie is required for usage of portal. Purpose This cookie saves if your browser is allowing cookies. Purpose Within that cookie are several built-in values that keep track of the visitor session. No personal information is stored. This Cookie is managed by the Tag Management System Tealium. Purpose Remembers your cookie settings regarding Tealium Tag Management.